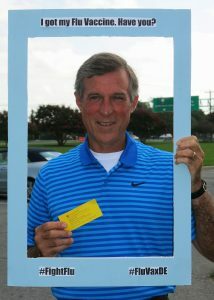 Delaware Governor John Carney, Lt. Governor Bethany Hall-Long, Department of Health and Social Services (DHSS) Secretary Dr. Kara Odom Walker and Department of Transportation (DelDOT) Secretary Jennifer Cohan were among hundreds who lined up to receive their annual flu vaccine Tuesday in Dover. “I got my flu vaccine. 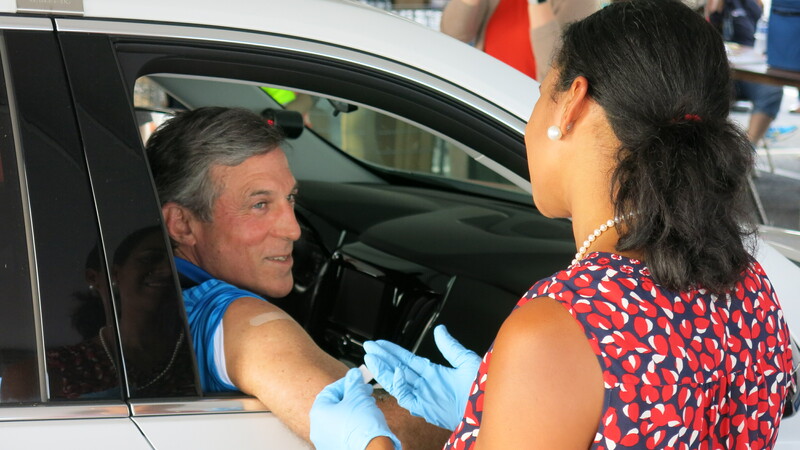 Have you?” asks Delaware Governor John Carney in his selfie at the Division of Public Health’s Oct. 9 drive-thru flu clinic in Dover. That is when the Division of Public Health (DPH) held its third annual drive-thru flu clinic in the parking lot in front of DelDOT’s Administrative Building on its main campus. The drive-thru flu clinic began at 7:00 a.m. and runs until 6:00 p.m. DPH nurses, joined by nurses from the Division’s partners at Bayhealth and the Delaware Medical Reserve Corps, administered intramuscular flu vaccines to drivers, their passengers and even pedestrians age 9 years and older. Governor Carney asked all Delawareans ages 6 months and older to get their flu vaccines early, preferably by the end of October, to protect against influenza illnesses and complications. “Getting an annual flu vaccine is the best thing you can do to keep from getting and spreading the flu, and keep you from missing work, school, and important family events,” said Governor Carney, who went through the drive-thru lanes as a passenger in a DelDOT vehicle. “I believe in leading by example and that’s why I’m taking this very public opportunity to get my flu vaccine.” Flu clinic staff are prepared to administer 1,100 flu vaccines, more than the 887 given last year. DPH Director Dr. Karyl Rattay advises Delawareans to get their flu vaccine as soon as possible because it takes about two weeks after vaccination for antibodies to develop in the body that protect against influenza virus infection. Flu activity began early this year in Delaware. The official start of the 2018-2019 didn’t begin until September 30, but by then, 12 laboratory-confirmed cases already had been reported in September. The cases, which were statewide, included five pediatric cases and one hospitalization. By the end of last week, there were already four laboratory-confirmed cases reported for the season’s first official week. During the 2017-2018 flu season, Delaware recorded 9,051 flu cases, the highest number of laboratory-confirmed flu cases since record-keeping began in 2005. Over 1,200 people were hospitalized due to the flu and 35 people died from flu complications. Lt. Governor Bethany Hall-Long, who is also a nurse, drove through in her vehicle to get her flu vaccine. She reminded everyone that getting the flu vaccine is important for people of all ages, and not just those in high-risk groups such as those who are older or with compromised immune systems. She said the vaccine is also the best way to prevent not only flu illness, but also serious flu complications that may lead to hospitalization or death. The drive-thru flu clinic also doubled as a preparedness exercise, testing DPH’s readiness and capability to mass vaccinate the public in the event of a public health emergency. Accommodations for persons with access and functional needs were included in the clinic set up and interpreters for those using American Sign Language or speaking Spanish, French, or Haitian Creole were provided. This was the third year for DPH’s drive-thru clinic and the second year it was held on the DelDOT campus. DelDOT Secretary Jennifer Cohan also drove through the lanes to receive her flu vaccine. Getting the flu vaccine is easy. Flu vaccines are offered through physician offices, many pharmacies and some grocery stores. While not all physicians’ offices may have their vaccine supply in yet, you can still locate where flu vaccines near you are being offered. Just Google “CDC flu finder” and enter a ZIP code. DPH will also offer various other flu clinics throughout the season. A schedule can be found at https://dhss.delaware.gov/dhss/dph/fluclinics.html. According to the CDC, the 2018-2019 flu vaccine protects against three or four strains of the virus, depending on whether the trivalent or quadrivalent vaccine is administered. DPH will only be offering the quadrivalent vaccine at its clinics. High-dose vaccines for those 65 and older, and a nasal spray flu vaccine are also available through private providers and pharmacies. Delawareans should talk with their health care providers about which option suits their needs best. In addition to getting the flu vaccine, Delawareans can prevent the spread of the flu and other respiratory illnesses with good hygiene. Wash hands often with soap and water or use alcohol-based hand sanitizers with 60 percent alcohol. Cover coughs and sneezes with tissues and dispose of tissues immediately. If a tissue is not available, cough or sneeze into your inner elbow since droplets from a sneeze can travel up to 6 feet. Stay 6 feet away from others who are coughing or sneezing, and avoid touching your eyes, nose or mouth. Get enough sleep and exercise, manage stress, and eat healthy. Flu symptoms come on suddenly, and include fever, cough, sore throat, runny or stuffy nose, headaches and body aches, chills, and fatigue. Some people get complications including pneumonia, bronchitis, and sinus and ear infections. Those sick with the flu should stay home from work, school and other gatherings, and should not return until free of fever – 100 degrees F (37.8 degrees C) — without the use of fever-reducing medications for at least 24 hours. Those ill with the flu should avoid close contact with well people in the household, drink plenty of water and other clear liquids and treat fever and cough with over-the-counter medicines. Those who are very sick, pregnant or have a medical condition like asthma should call their doctors for antiviral medicines to make the illness milder, hasten recovery, and prevent serious complications, hospitalizations and even death. For more information about the flu, visit flu.delaware.gov or https://www.cdc.gov/flu/index.htm. Delaware Health and Social Services is committed to improving the quality of the lives of Delaware’s citizens by promoting health and well-being, fostering self-sufficiency, and protecting vulnerable populations. DPH, a division of DHSS, urges Delawareans to make healthier choices with the 5-2-1 Almost None campaign: eat 5 or more fruits and vegetables each day, have no more than 2 hours of recreational screen time each day (includes TV, computer, gaming), get 1 or more hours of physical activity each day, and drink almost no sugary beverages.